In this photo provided by France Bleu, rescue workers help after a school bus and a regional train collided in the village of Millas, southern France, Thursday, Dec. 14, 2017. 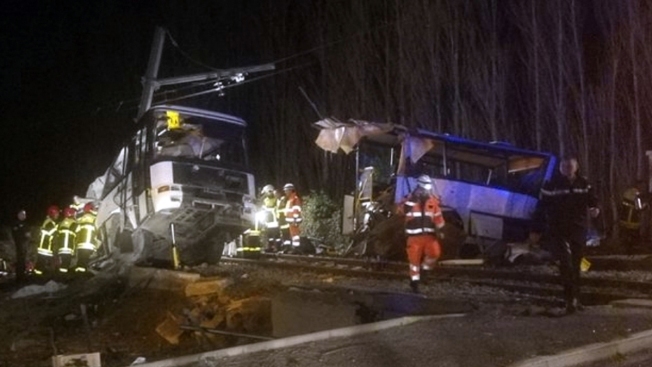 A school bus and a regional train collided in southern France on Thursday, killing four children and critically injuring several other people on the bus, the French interior ministry said. French authorities backtracked Friday, reducing the death toll from six children to least four after a regional train sliced open a school bus in southern France. Authorities in the Pyrenees-Orientales region said their statement earlier in the day that six children had died was not confirmed in the horrific crash at a crossing close to the Spanish border. Four children aged 12 or 13 died Thursday in the collision, and 18 others and the bus driver were injured. Philippe Vignes, the Pyrenees-Orientales chief, told BFM television that several children and the bus driver remained in serious condition on Friday. French authorities said all victims had been identified and their families notified. The bus was carrying students aged 11 to 15 from the Christian Bourquin school in the village of Millas, near Perpignan in southern France. The school opened its doors Friday to offer counseling for grieving students and families. Investigators were still working to determine the cause of the crash. Vignes said he could not say whether the railway barriers meant to stop vehicles from driving onto the tracks when a train is coming were open or closed. "There are contradictory rumors," he said. "We need to be very careful." Vignes told reporters overnight that investigators would look into reports that the batteries in the automatic train gate system had been stolen. National railway company SNCF said the train was carrying 25 people, including passengers and crew, and all were accounted for and being offered counseling. She said the train normally travels at 80 kph (50 mph) at that location.